Wear-emin is a compact, digital music synthesizer that is controlled through hand motions designed to replicate those normally used to operate a traditional Theremin. 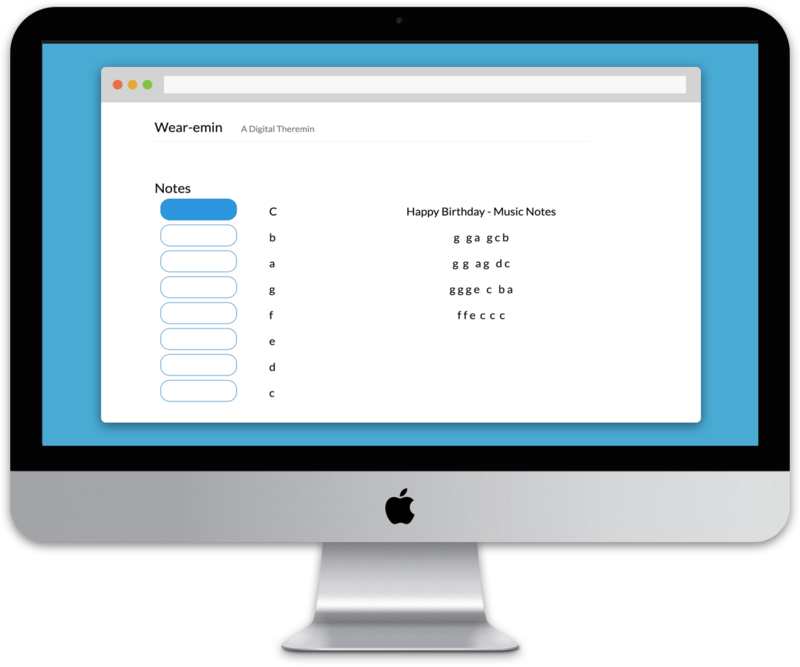 The Wear-emin is paired with a web application that provides the user with an interface that helps users to learn how to use the device and become more proficient in using it by giving them visual feedback for their actions. Playing a musical instruments makes for an enjoyable pastime, but the biggest challenge for anyone trying out a musical instrument for the first time is the learning curve. A digital version of a theremin which is compact so that the users will be able to create music on-the-go. All the interactions between user and instrument can be done with one hand and the associated web application helps in making the learning experience easy and fun. We wanted to apply a no-touch interaction principle to a wearable, digital, musical device. The traditional Theremin is an electrical musical instrument that works on the principle of changing its pitch and volume of a tone. A Theremin creates a magnetic field through its antennae that the user moves their hands around, thereby altering the field and affecting the sound produced. The motivation for this idea comes from both an interest in games and game design among the members of our group as well as from the Fun Theory Initiative by Volkswagen. Fun Theory is a gamification-styled initiative to encourage people to do good things by making the tasks more fun to perform. Particle Photon - Microcontroller used to create Internet of Things devices. 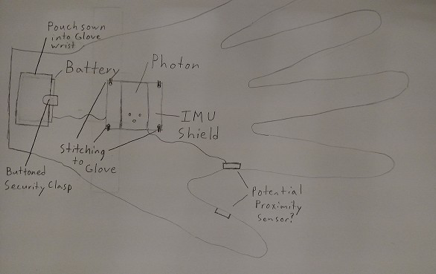 Inertia Measurement Unit (IMU) shield –To process gesture based input. The proximity Sensor – Which takes in infrared light to gauge the distance between the user's thumb and the sensor’s lenses. 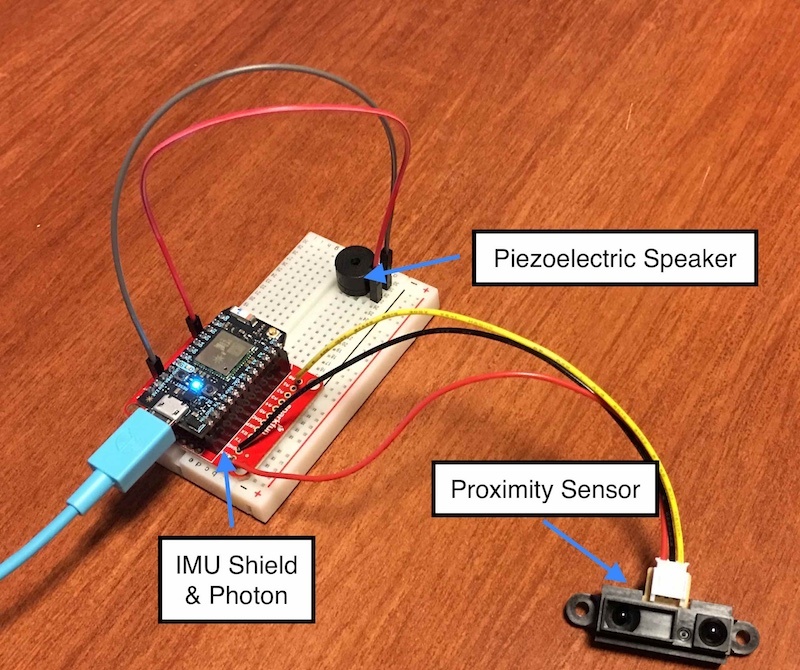 Piezoelectric Speaker – Simple buzzer to produce sound. The Wear-emin is affixed to the back of a leather gardening glove, chosen for its relative rigidity and material thickness over cloth, to minimize the chance of the Wear-emin shifting in place and reducing a user’s accuracy of control. 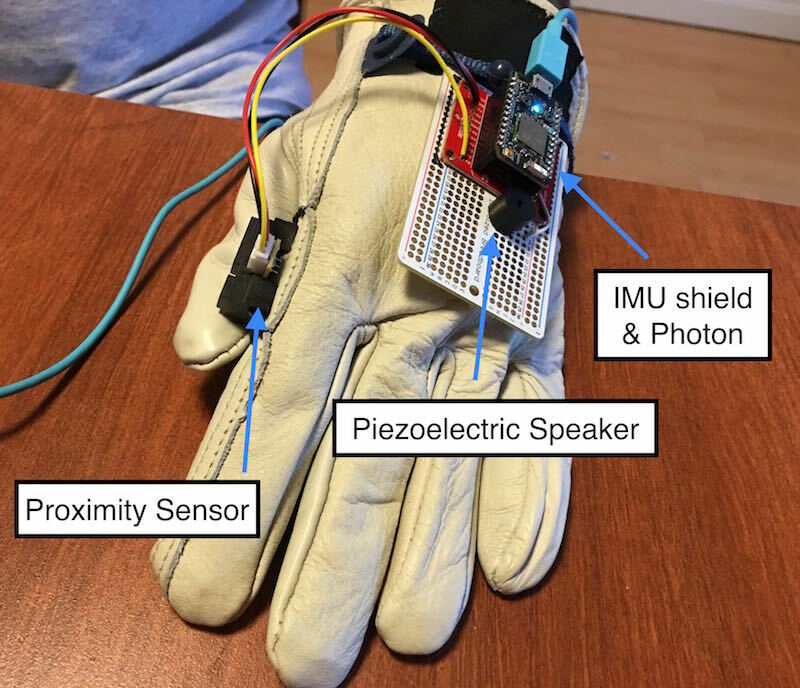 The breadboard that houses the Photon, IMU, and speaker was sown to the center-back of the glove to allow for control through the wearer’s wrist movements. Meanwhile, the proximity sensor was mounted to the side of the glove's index finger to be controlled by moving one’s thumb in and out of the sensor’s line of sight. Finally, the glove came with a drawstring cord used to adjust the fit of the glove around the wearer’s wrist. The web application was designed to provide visual feedback to the user about the notes being played, based on the input the application got from the proximity sensor. It contains an array of 8 blank rounded rectangles that represent each note in an octave. As the user plays the Wear-emin, whichever note the user is currently playing will be colored in. 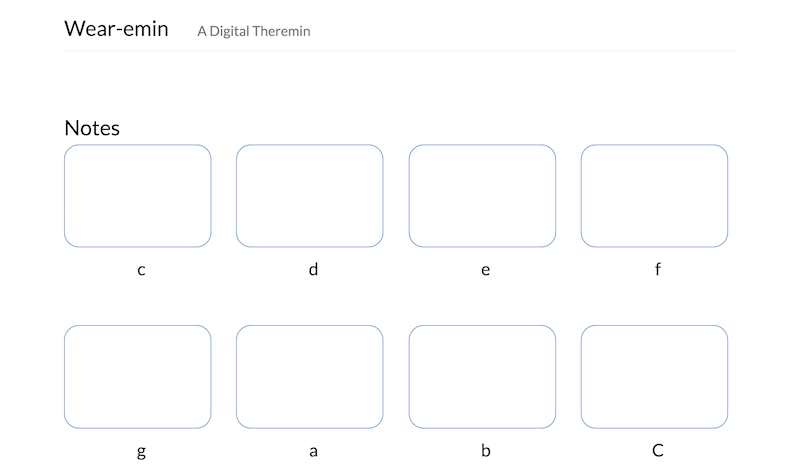 Initially, the rounded rectangles representing the notes were displayed in 2 rows and 4 columns.However, we changed this to a single vertical column of rounded rectangles to better mirror the physical motion of using the wear-emin. 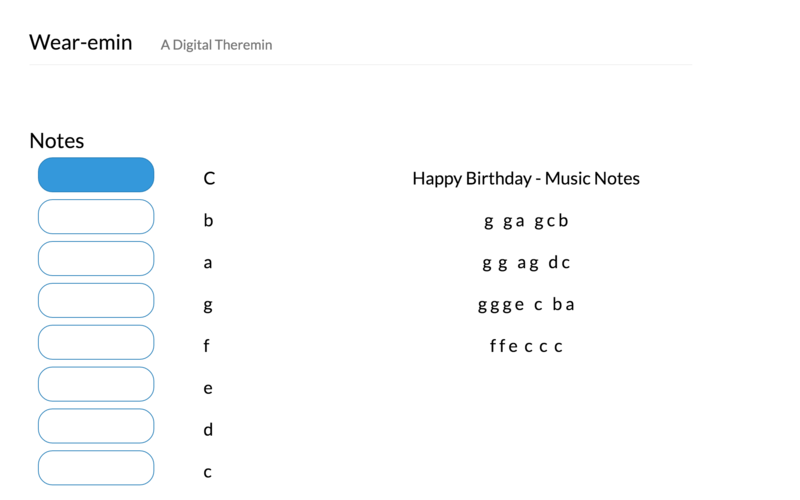 Alongside this, a (short) melody of “Happy Birthday” was displayed so that the user could try to play those notes on the wear-emin. After putting the Wear-emin on one’s left hand, turning the device on, and activating the associated application; using the Wear-emin is as simple as flexing one’s hand up and down at the wrist to navigate the musical scale. Upward wrist motion produces higher pitches with downward motion creating lower ones. Quick motions of the thumb across the sensor will produce one note, while leaving the thumb in place will place a continuous sound.